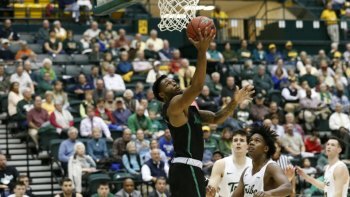 WILLIAMSBURG, Va. – A performance of 32 points, 12 rebounds and nine assists from junior guard Jon Elmore were not enough to help the men’s basketball team out-gun the William & Mary Tribe in a 114-104 loss on Wednesday night at Kaplan Arena. With the loss, the Herd fell to 4-3 overall, while the Tribe rose to 4-2. Junior guard C.J. Burks tied a career-high with 27 points, while freshman guard Jarrod West added 22 points from a career-high six three-pointers and eight field goals. William & Mary’s Connor Burchfield connected with 10 3-pointers to score 30 points, while Nathan Knight finished with 31 points and 12 rebounds. David Cohn had a double-double of his own from 20 points and 13 assists. The first half was a back-and-forth period that featured seven lead changes. Both sides traded baskets until the Tribe had an 11-point lead with 8:32 to go. The Herd battled back and tied things up at 41-41 with 3:36 to go thanks to West’s three 3-pointers and Elmore making four free throws. William & Mary then closed out strong with a 51-44 lead to close out the first half. After surrendering a Tribe field goal, Marshall went on a 13-4 run to tie things up at 57-57 with 16:43 to go. The rally came from efforts of Elmore, Burks and junior forward Ajdin Penava. From there, the Herd continued its momentum and even had an eight-point advantage and had a 77-69 lead. Burchfield single-handedly led the comeback against Marshall and hit three consecutive three-pointers to give William & Mary the advantage. That one-point edge held for the rest of the contest and grew for the rest of the game, as the Herd fell, 114-104. William & Mary made 18-of-28 (64.3 percent) shots from behind the arc. Marshall finished the game shooting 37-of-71 (52.1 percent) from FGs, 12-of-27 (44.4 percent) from three-pointers and a season-high 18-of-19 (94.7 percent) at the free throw line. Marshall will return home to the Cam Henderson center for welcome former Mid-American Conference rival, Akron, on Saturday, Dec. 2, at 7 p.m.